If i'm interested, i'll read it. The undertaking of lily chen. 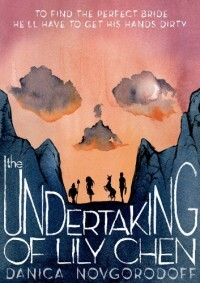 The book "the undertaking of lily chen" is about a adventure a lady has with man. The lady is Lily Chen and let me tell you what happen to her in this story. It all started with the man, his brother and him were fighting at the air force. The brother was so drunk he didn't know what he was doing, while fighting a car hits him and he died but the man runs away to his parents house. The parents were devastated on his son death, they ordered the other son to bring his dead boy a wife for the after life. In the way to bring a wife for his brother he meets a girl that was going the same way as he was, she was lily, lily was going to be force to marry a man for her family to keep their house. As the journey continue, lily starts falling in love with the guy, and when he has to go back to give a dead bride he couldn't because he couldn't find a fresh dead girl. Therefore, Lily had an idea to pretend she is dead and then they could run away together. That's what happens at the end she pretend she is dead, and then when everyone left he unbury her, and continue their journey.